With the arrival of the first chills of Autumn in Spitalfields, my mind turns to thoughts of steaming meatballs. So I hot-footed it up the road to Bethnal Green and the kitchen of Maria Pellicci, cook and beloved matriarch at E. Pellicci, the legendary cafe that has been run by her family since 1900. Although I find it hard to believe, Maria told me that meatballs are not always on the menu here because people do not ask for them. Yet she graciously assented to my request, and even granted me the honour of permitting my presence in her kitchen to witness the sacred ritual of the making of the first meatballs of the season. For many years, meatballs and spaghetti comprised reliable sustenance that could deliver consolation on the grimmest Winter day. If I found myself in a cafe and meatballs were on the menu, I had no reason to think further because I knew what I was having for lunch. But then a fear came upon me that drove away my delight in meatballs, I began to doubt what I was eating and grew suspicious of the origins of the ingredients. It was the loss of an innocent pleasure. 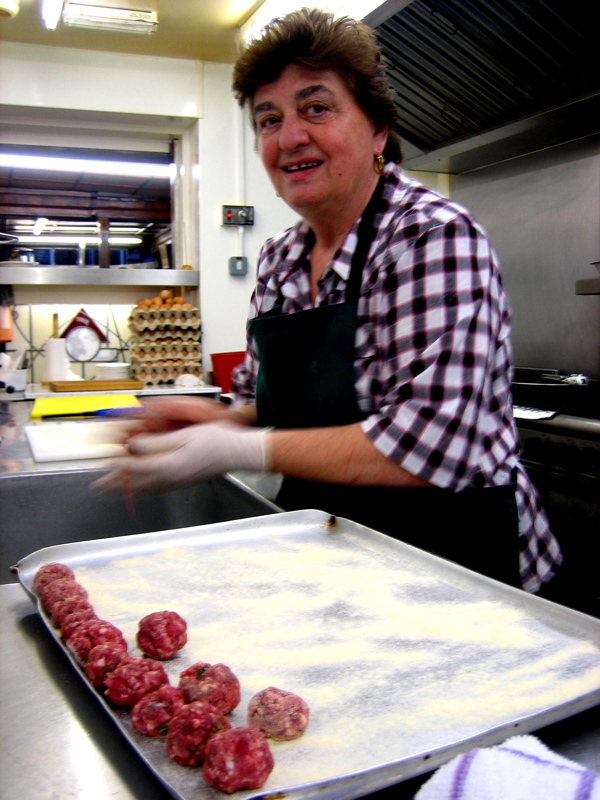 Thus began the meatball famine which lasted ten years, that ended this week when Maria Pellicci made meatballs specially for me with fresh meat she bought from the butcher in the Roman Rd. Maria has worked daily in her kitchen in Bethnal Green from six until six since 1961, preparing all the dishes on the menu at E.Pellicci freshly as a matter of principle. More than this, reflecting Maria’s proud Italian ancestry, I can confirm that for Maria Pellicci the quality of her food is unquestionably a matter of honour. I was at the snug corner table beside the serving hatch in Pellicci’s immaculately cosy cafe next day at the stroke of twelve. After ten years of waiting, the moment was at hand, as Anna Pellicci, Maria’s daughter proudly delivered the steaming dish, while Salvatore, Maria’s nephew, brought the Parmesan and freshly ground pepper. The wilderness years were at an end, because I had spaghetti and meatballs in front of me, the dish of the season. Maria made the tomato sauce that morning with garlic, parsley and basil, and it was pleasantly tangy and light without being at all glutinous. As a consequence, the sauce did not overwhelm the subtle herb-inflected flavour of the meatballs that crumbled and then melted in my mouth, the perfect complement to the deliciously gelatinous spaghetti. Sinking my teeth into the first meatballs of the twenty-first century, I could only wonder how I lived through the last decade without them. I call upon my readers to help me keep meatballs on the menu at E. Pellicci now, because we need them to help us get through the Winter, the government cuts, the Olympic games, and the entire twenty-first century that is to come. Let us send a collective message to the Pelliccis, that we love their meatballs with spaghetti, because when we have a cook like Maria Pellicci, the meatball queen of Bethnal Green, we cannot forgo the privilege of her genius. 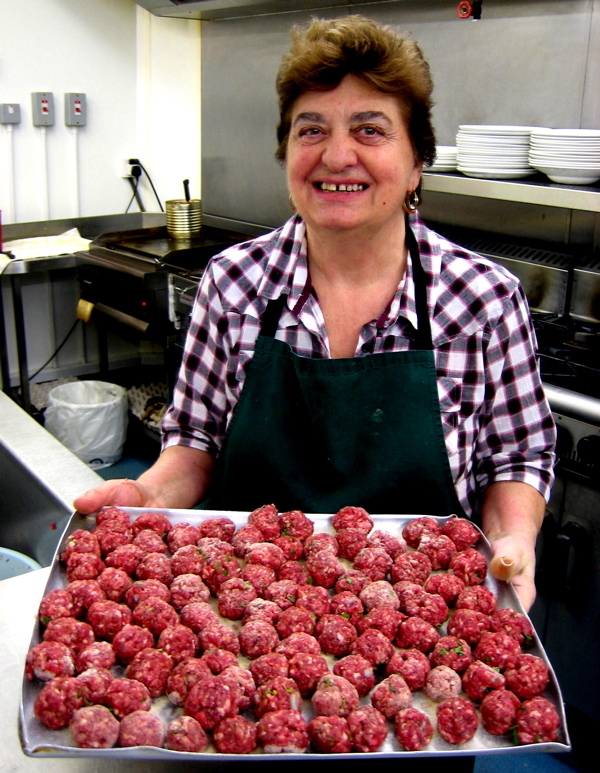 Maria Pellicci has been making meatballs in Bethnal Green for half a century. Anna Pellicci with the first meatballs of the season in Bethnal Green. 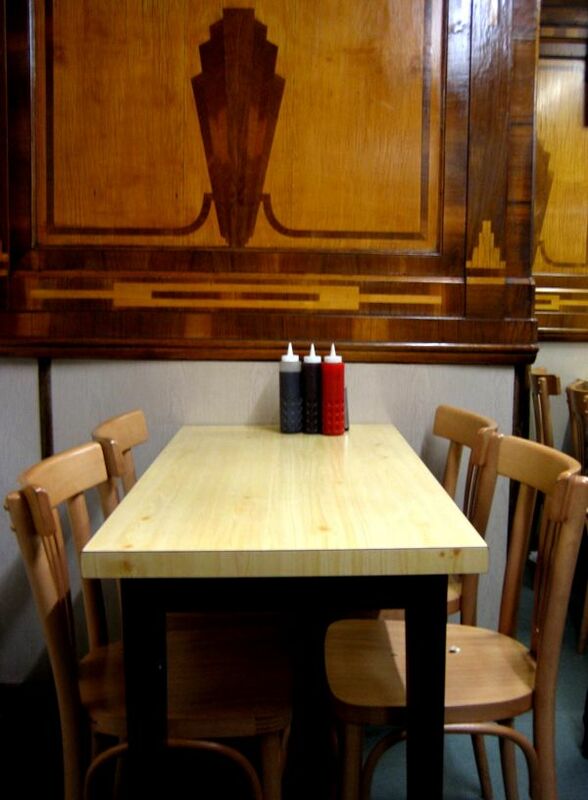 The coveted corner table, next to the serving hatch at E. Pellicci. I must go and try these now my Dad is no longer here to make me beautiful meatballs – they look just as good! My eleven year old son is the only meatball eater in this family. This means that I make up big batches from a Delia Smith recipe (pork mince, bacon, parmesan, eggs, bread, milk, nutmeg and seasoning) and freeze them, defrosting just half a dozen at a time. The recipe is meant to include parsley but trying to pass off something green to a young lad is too difficult (unless it’s courgette cake). I wonder if I could get him to eat Maria Pellici’s – I must try some time. Have always meant to go to Pellici’s – this could be my excuse. i used to have a sicilian mother-in-law who put a touch of mint in her meatballs, being a touch north african herself. heaven. When I visit my son who lives in Brick Lane we always visit Pellici’s. I love the place and , although I only get to go there a couple of times a year , we are always greeted like old friends by “Young Nev” . I will have the meatballs next time I go if I can , they look and sound delicious ! Godbless all the Pellici family , I hope I’ll see them again soon. Wow – if Pellici’s has been in existence since 1900, then just maybe my Jewish Grandmother Fanny Levy tried them out because they lived in Artillery Lane and I think your place must be not far from there. They sound absolutely delicious…I adore meatballs….